A bipartisan measure has passed that could improve the quality of the food served in schools. Over the last two years, I’ve kept you updated on Civil Eats regarding a brewing controversy over school food nutrition standards. That battle now seems likely to end in a relative victory for children’s health. Here’s the background. Greatly improved school meal nutritional standards went into effect in the 2012-13 school year, requiring more whole grains, a reduction in sodium and more fruits or vegetables. 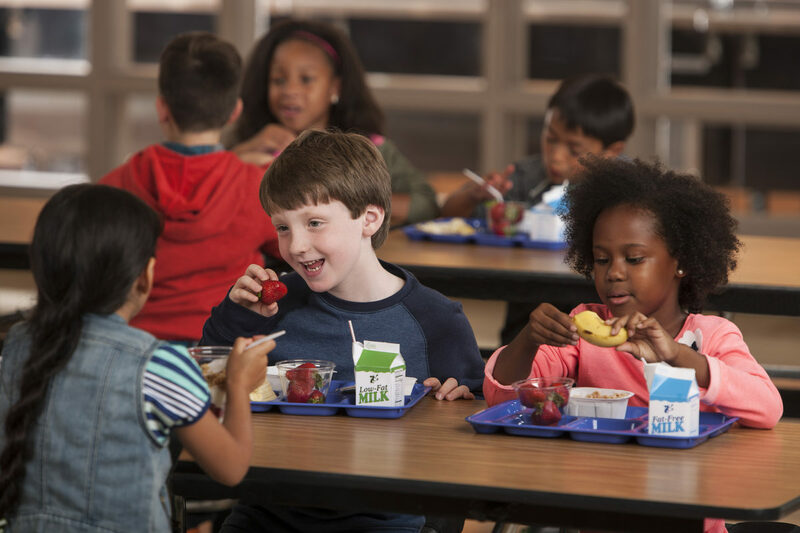 When they were first adopted in 2010, these new standards received bipartisan support as well as the endorsement of the School Nutrition Association (SNA), the nation’s leading organization of 55,000 school food professionals. But by early 2014, these same nutritional improvements looked like they might be rolled back. Claiming difficulties in implementation and increased food waste, the SNA surprised many observers by embarking on an aggressive lobbying campaign to weaken them during the 2015 reauthorization of the Child Nutrition Act. While some speculated that Big Food (which funds half of the SNA’s operating budget) was behind this sudden about-face, Politico‘s Helena Bottemiller Evich reported last summer that, by and large, the food industry had little interest in weakening the new standards because they had already spent time and money conforming its products to them. Instead, among the SNA’s main allies in this fight were House Republicans, which meant that school food, historically a bi-partisan issue, became unusually politicized. But after two years of highly charged, partisan debate, Senate Agriculture Committee Chairman Pat Roberts (Republican-Kansas) and Ranking Member Debbie Stabenow (Democrat-Michigan) have managed to broker a deal— the Improving Child Nutrition Integrity and Access Act of 2016. And so far it seems acceptable to both advocates and the SNA, while still supporting the kids’ health. Whole Grains: Under the current, improved nutrition standards, all grain-based foods served in schools have to be “whole grain-rich,” meaning at least 51 percent the product’s grain content must be whole grain. Citing alleged student rejection of these foods and problems with manufacturer supply, the SNA sought to weaken that rule by requiring that only half of all grain foods served be whole grain-rich. Under the compromise, the parties have settled on an 80 percent whole-grain rich standard, which means 20 percent of grain foods served could contain only refined grains. As a result, schools would be allowed to serve items like white rice or a white tortilla once a week, providing the school food operators with more flexibility. Fruits and Vegetables: The 2010 nutrition standards required children to take a half-cup serving of fruits or vegetables at lunch, but the SNA has sought to revert to the old system under which kids could pass up these healthful foods, potentially creating an all-beige tray on a daily basis. The Senate Agriculture Committee bill preserves the half-cup requirement, which is widely seen as a significant victory for health advocates and for the produce industry. However, the bill also asks the Centers for Disease Control and Prevention and the U.S. Department of Agriculture (USDA) to provide guidance on the use of salad bars and so-called “sharing tables” (on which kids place unwanted, uneaten fruits and vegetables) to minimize food waste and ensure food safety. Sodium: Schools were already required to reduce sodium to meet so-called Target 1 levels by July 1, 2014. But in response to complaints from school food operators and some food manufacturers, the bill would give schools an extra two years (until July 1, 2019) to reach the next level of sodium reduction (Target 2). The bill further provides that a study will be conducted at that time to determine whether the final planned level of reduction (Target 3) is scientifically warranted, as well as evaluate the impact of the Target 2 level on school meal programs. A La Carte Foods: While the new “Smart Snacks in School” rules greatly improved competitive foods and beverages (sold in outlets like vending machines, fundraisers and school stores), some school food operators have complained that these rules limit their own a la carte sale of nutrient-dense but higher calorie items like hard-boiled eggs, hummus and low-fat pizza. Accordingly, the bill would establish a working group to exempt some nutrient-dense snacks. Other Items: The bill also includes provisions to: authorize a loan guarantee program for school food service equipment; double funding for Farm to School grants; require USDA to develop a plan to encourage the use of salad bars; and establish a School Nutrition Advisory Committee. The bill would also require studies on: best practices for nutrition education; training and technical assistance to help schools serve healthy food to kids; and if the varieties of milk served in schools affect milk consumption. And it would allow struggling schools a three-year transition period to move from serving canned, frozen, and dried to fresh fruits and vegetables in the Fresh Fruit and Vegetable Program. A version of this post originally appeared on The Lunch Tray.